Red Hippo: Christmas in California! The five of us traveled home for Christmas this year. We were so excited to see family, hang out with friends, and introduce our newest family member to everyone! We spent Christmas Eve Eve with my side of the family- the kids played in the garage, where auntie sarah decorated with snowflakes and huge boxes for the kids to take cover in while throwing fake snowballs at each other. It was so good to be with my family- lots of laughter and catching up. Christmas Eve morning and afternoon we spend with my sister's family and my mom. 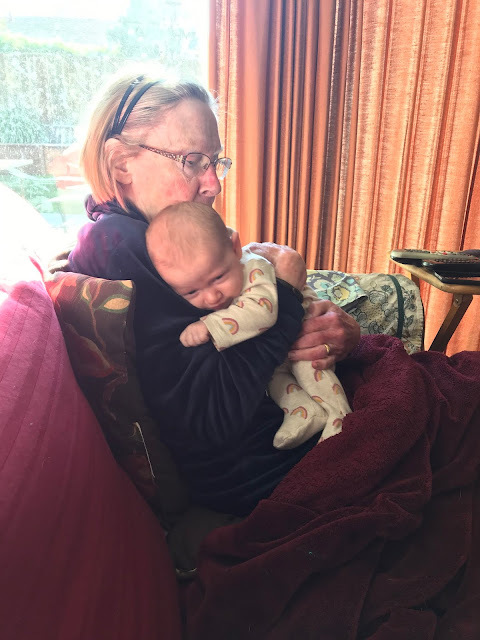 I know my mom really enjoyed spending time with her FIVE grandchildren. We all exchanged gifts and the kids ran around my mom's house looking for places to hide. My sister gave me the most wonderful gift, a framed photo of my daddy, circa 1970's. Sheesh. I cried. Christmas Eve night we went to Tony's parent's. They always make a beautiful Christmas Eve dinner and they always have LOT'S of candy and cookies...let's just say, I was in heaven. Easton showed his fourteen year old cousin some tricks on the game Fortenight...I had no idea he knew how to play the game so well (forehead slap). We woke up on Christmas morning at Nana and Grandpa's. The boys received some pretty amazing gifts from Santa (a polaroid camera for Easton and a cross necklace for Sailor). They were gifted with bean bag chairs and slippers from Nana & Grandpa, shoes from us, and legos...plus a few other building sets, and crystals/rocks from our family on Christmas Eve Eve and Christmas Eve. Packing everything to take home was quite the challenge. A couple days after Christmas my girlfriends surprised us with a Baby Shower for Poppy and I. I was in so much shock and joy...i cried. Again. Gosh, it was so wonderful to hang out with my friends- it's been two and a half years since we've moved to Washington and I still miss my girls more than anything. Poppy and I went on four hikes while we were in the Bay. I got to spend time with Brandi on our first hike, Christine on our second hike, Nadine on our third, and Shayne & JJ on our fourth hike. Easton joined the hike with Christine and her kids- they did a solid four miles of the Santa Cruz mountians...I was impressed. We also got to spend some real quality time with our best family friends. We spent an evening with the Weisgerber families- who melt my heart from joy every time we are all together. 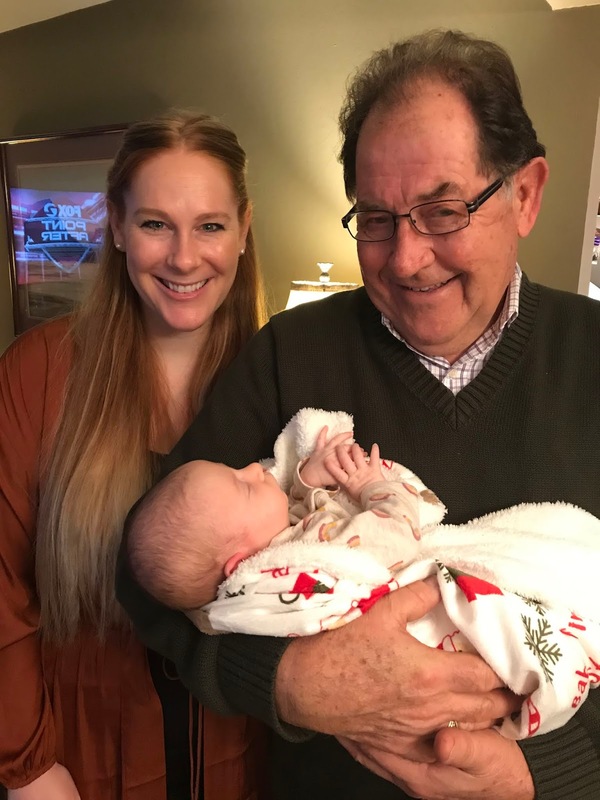 Megan's baby and Poppy are four weeks apart in age and it was so fun to introduce them! 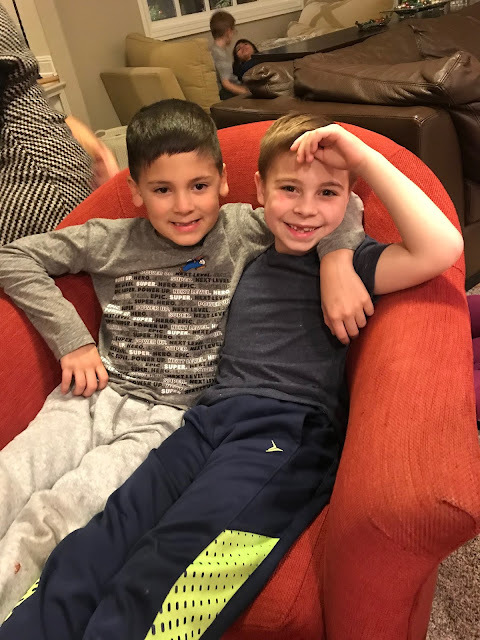 Lisa's kiddos and my boys are best of friends- they just pick up right where they leave off every time they see each other! Our other family friends, JJ & Shayne and crew cooked us dinner and hung out until late...like we always do. Plus we did a hike in Palo Alto and went straight to the Stanford Shopping Center for lunch...putting those calories right back in after we burned them off! Gosh, we are so blessed with friends and family. All it takes is one trip home to realize just how lucky we are. Poppy is TWO months old!